WaterStart, a Las Vegas-based nonprofit partnership of public- and private-sector organizations, is diligently working to diversify the Las Vegas economy, create job growth and provide answers to drought and water quality issues in Nevada. Its goal is for Las Vegas to become the Silicon Valley of water technology. 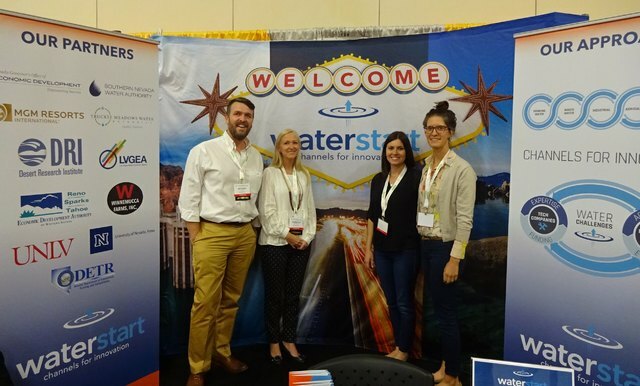 Craig A. Ruark, Las Vegas Business Press WaterStart Executive Director Nathan Allen, left, with staff members Rebecca Shanahan, Cecilia Sample, and Raja Bushnell, pose in front of the WaterStart booth at the Water Smart Conference, which was held in Las Vegas in October. WaterStart, a Las Vegas-based nonprofit partnership of public- and private-sector organizations, is working to diversify the Las Vegas economy, create job growth and provide answers to drought and water quality issues in Nevada. Its goal is for Las Vegas to become the Silicon Valley of water technology. A spinoff from the Desert Research Institute, WaterStart is a 501(C)6 organization that gets its funding from the Governor’s Office of Economic Development. It also receives matching funds for specific projects from its public and private partners, Southern Nevada and Truckee Meadows water authorities, MGM Resorts, Winnemucca Farms, LVGEA, Reno Sparks Tahoe Economic Development Authority, and the University of Nevada, Las Vegas and University of Nevada, Reno. Entering its second year of funding, WaterStart was networking with more than 1,500 water conservation professionals from the U.S., Canada and Mexico during the ninth annual Water Smart Innovations Conference and Exposition at the South Point in October. Nathan Allen, executive director of the WaterStart initiative, explained that there are three basic drivers to the organization: to solve water challenges in Nevada through the use of new and innovative technology, build partnerships between private industry and the academic community and diversify the economy by attracting new businesses that create jobs. To find these innovative technologies, Allen, with a Bachelor of Arts in environmental science and geology and a master’s degree in environmental education, has participated in the Governor’s Trade Mission, most recently to Australia, in an effort to facilitate an exchange of ideas. The WaterStart team is not looking at conceptual ideas; it is only interested in prototypes that have been proven in the laboratory but have not had the opportunity to bring the product to market. In the past 23 months, the four-member WaterStart team has vetted more than 150 technologies, received proposals from more than 60 companies that want to work with them and funded eight projects. One of the projects is the installation of more than 3 miles of leak detection equipment on the water line that runs below the Las Vegas Strip. Edchologics, a Canadian company, is the first to develop this technology using a special microphone called a hydrophone that can hear water escaping. Another company, Syrinix, headquartered in the U.K., also is testing their TrunkMinder and PipeMinder on water lines in the valley to monitor pressure and flow data. WaterStart is also responsible for bringing IONEX, a California company that builds customized, small-scale water treatment plants to Nevada. IONEX plans to build an assembly and research and development facility in North Las Vegas, and estimates are this company will bring $2.5 million in tax revenue to the state. IMGeospatial, a British company, has worked with utility companies throughout Europe to supply water managers with automatic cloud-based analytics for their internal geospatial platforms. WaterStart paired the company with the Desert Research Institute to utilize its automated, patent-pending flood-modeling solutions. WaterStart is also close to completing a deal with IMGeospatial that will establish a Las Vegas branch office to house a software development team. Winnemucca Farms, the largest agricultural producer in the state with 35,000 acres of irrigated land, has adopted water-saving irrigation technologies from around the world. Working with WaterStart, it is experimenting with a company that uses drone technology to measure plant stress from the air and improve irrigation precision while saving even more water. All 17 counties in Nevada have been under a Drought Emergency Declaration since 2012. Besides having a lack of water for drinking, the drought has caused major problems with the buildup of nitrates in the groundwater.